Latin America and the Caribbean come together to celebrate this year’s International Volunteer Day (IVD), in cooperation with several UN agencies, government entities, the academia, and national and international non-governmental organizations. In a region that faces challenges related to migration and natural disasters, this year’s theme "Volunteers build resilient communities", gathers stories where local volunteers have made invaluable contributions when responding to these situations. 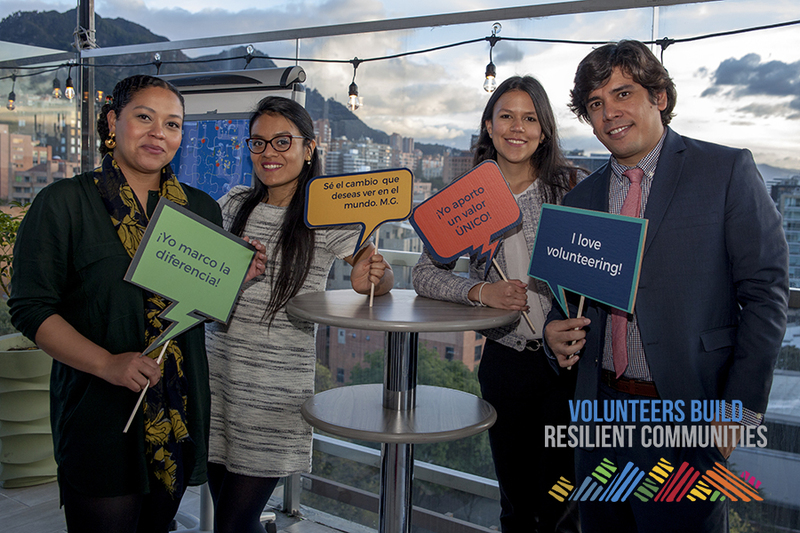 UN Volunteers in Colombia celebrate their passion for volunteering and contribution to peace and development in the country. The celebrations started in Ecuador, with the Regional Launch of the State of the World’s Volunteerism Report (SWVR) 2018, along with FLACSO and local Governmental and civil society organizations. The Regional Manager of UNV for Latin America and the Caribbean, Lita Paparoni, presented the main findings of the report, highlighting that in the region there are 13.3 million full-time equivalent volunteers; the vast majority of volunteer work, 74 per cent, does not involve organizations, but happens directly between people in their communities. Lita was joined by Arnaud Peral, UN Resident Coordinator and UNDP Resident Representative in Ecuador, María Amelia Esponisa, from Plan Toda una Vida Ecuador, and regional experts on volunteerism and migration: William Spindler of the UN Refugee Agency (UNHCR), Juan Enrique Quiñonez UN Children's Fund (UNICEF), Susana Barnetche (AMEVOL Mexico) and UN Volunteers in Guatemala and Ecuador. The launch was followed by an activity in the field reflecting the role of volunteerism and resilient communities facing natural disasters: UNV joined the Secretary of Risk Management and more than 100 volunteers, in a massive reforestation of the Atacazo, a volcano that suffered a forest fire in October 2018. The celebrations in Mexico also started last week, focused on the inclusion of youth as major contributors in the response to local challenges. UNV , along with UNFPA Mexico, the Secretary of Social Development of the State of Puebla and the Mayor of Xiutepec, came together to support families affected by floods. The 2030 Puebla Youth Program volunteers joined local families in painting a total of 30 houses located in the affected area. Besides, UNV will make a presentation of the SWVR in the Mexican Parliament, accompanied by representatives from the public and private sector, civil society and youth programmes. Local presentations of the SWVR will also be held in Guatemala and Bolivia, the two countries where local research was conducted. UN Volunteers and local participants who conducted the SWVR research in the field will lead the presentation of results, sharing their stories of resilience in the context of natural disasters. In Guatemala, this will be presented ad part of the National Congress on Volunteerism in coordination with the Guatemalan Volunteer Center, while Bolivia will launch the SWVR along governmental institutions and UN Agencies. Colombia will also recognize the role of volunteers with the 6th Edition of the National Prize for Youth Volunteerism, organized along by Colombia Joven, the Transparency Secretariat of the Republic, UNDP Colombia, and UNV Colombia. Since August, Colombia Joven received multiple online nominations in this call for their 5 categories: Águila Dorada, Colibrí Diamante, Mariposa Amatista, Búho de Plata and Guacamaya Sostenible. Although there will be only 5 official winners, all the nominees represented the importance of volunteerism in the achievement of solutions to the most pressing problems that afflict their communities, contributing to entrepreneurship, equity and the achievement of the Sustainable Development Goals. In Panama, UNV will co-celebrate IVD with the United Nations Development Programme-Global Environment Facility project: Strengthening human resources, legal frameworks, and institutional capacities to implement the Nagoya Protocol (Global ABS Project) and TECHO, in a national consortium of volunteers. People representing the private sector, universities, indigenous populations and the UN system will share their experiences on how the engagement of external actors and local volunteers can transform communities through mutual aid, transfer of traditional knowledge and equal distribution of benefits. More countries in the region - Haiti, Trinidad and Tobago, Brazil, El Salvador and Venezuela - will also be part of these celebrations, hosting local events and joining the online campaign. UNV believes that IVD is an ideal opportunity to celebrate the significant impact of volunteerism in Latin America and the Caribbean, and to advocate for the permanent recognition of volunteerism through the creation of national infrastructures, the integration of volunteerism into national resilience strategies, and the support to research initiatives for the measurement of volunteer contributions to peace and development. In doing so, voluntary action can continue to be a renewable resource and a foundation of resilient societies in the region.